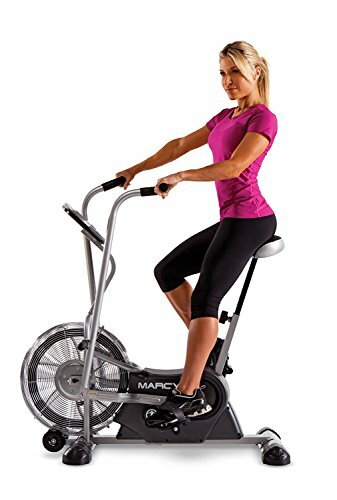 Stay cool while working up a serious sweat with the Marcy Air 1 fan bike. 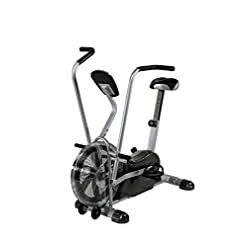 The Air 1 is equipped with dual-action arms that work the upper body while the pedals work the leg muscles, giving you an efficient full body workout with every ride. 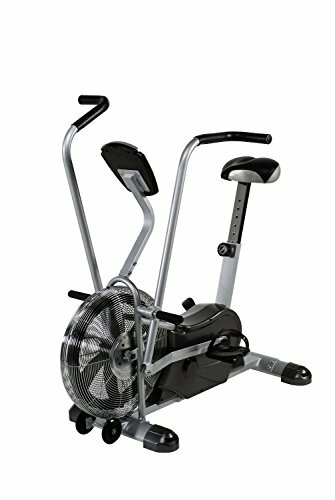 Resistance comes from the built-in fan; the faster you pedal, the harder the workout. The fan doubles as a cooling agent, pushing air past your body to keep you cool while training. 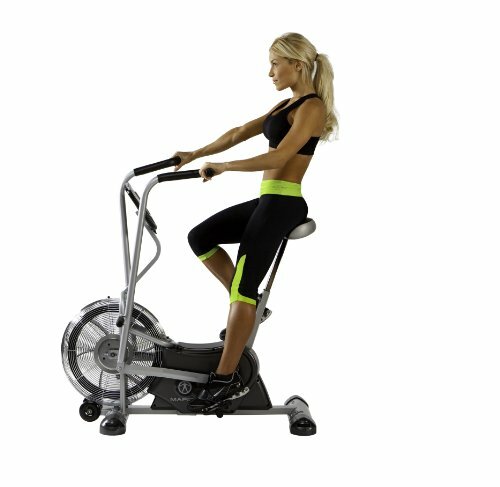 It’s easy to monitor your workout progress thanks to the Air 1’s integrated computer, which tracks your speed, time, distance, and calories burned. 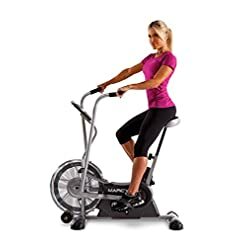 And the Air 1 doesn’t skimp on rider comfort, with a high-density foam seat with a durable vinyl covering, foam-covered handlebars, and weighted and counterbalanced pedals with adjustable foot straps. Construction-wise, the bike is made using 1-by-2.25-inch rectangular tubing and 1.25-inch round, 24-gauge steel tubing, all coated with a durable powder-coat finish. 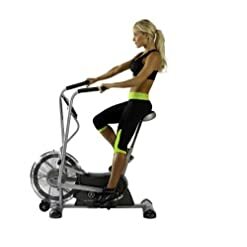 Other details include a shroud cover made of molded ABS, transport wheels for easy mobility, and a two-year manufacturer’s warranty. The computer panel is battery powered and requires two AA batteries (not included). 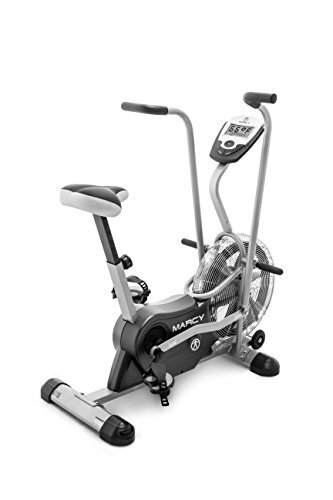 HIGH-TECH LCD MONITOR – The Marcy AIR-1 exercise fan bike has a LCD computer screen that acts as an odometer. 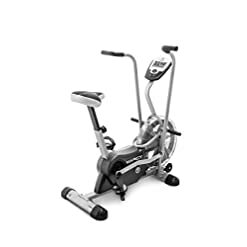 The state-of-the-art sharp panel LCD screen displays time, speed, distance, and calories large enough for easy visibility. 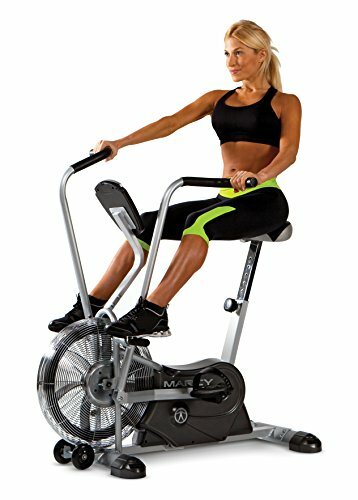 ADJUSTABLE SEAT POSITIONING – This stationary bike features an adjustable seat that can accommodate users of different body types. 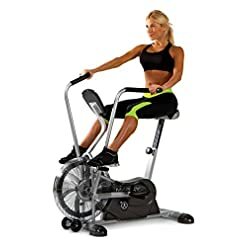 The adjustable seat facilitates proper body form during exercises and allows the body to precisely conform to the equipment.